BSOD’s are frustrating for everyone and often difficult to find. The IRQL_NOT_LESS_OR_EQUAL BSOD usually comes from a hardware driver or hardware conflict. This means one of two things: Driver problems or a bad Windows service caused by a backup utility or antivirus. The error “Stop 0x0000000A: IRQL_NOT_LESS_OR_EQUAL” usually occurs when Windows starts. It is usually associated with a bad driver or defective or incompatible hardware or software. Technically, this error condition indicates that a process or driver in kernel mode has attempted to access a disk space for which it had no permission or too high an IRQL level (kernel interrupt request). 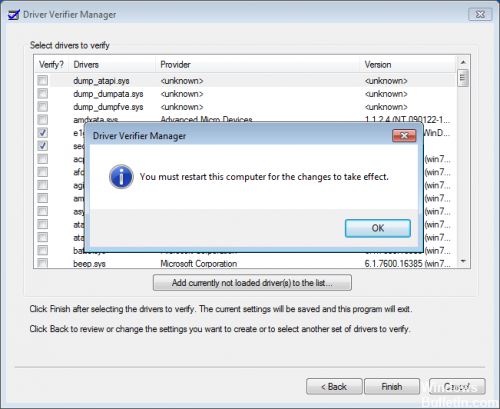 To track the driver for the specific problem, you must run Driver Verifier, an application included with Windows. Enter the validator in the field and press Enter. Select Create default settings, then click Next and select Automatically select all drivers installed on this computer. Restart your computer and you will see the list of drivers to check at startup. If a defective driver is available, you will receive a BSOD with the corresponding error message. You can then identify and uninstall the listed driver when you log back on to Windows. You can now try to debug your computer at the hardware level. As mentioned at the beginning, the error irql_not_less_or_equal normally occurs when something tries to access a storage space for which it has no authorization. The first thing you need to do in this case is to test your device’s memory. Windows provides a utility that can do this for you. Open the search term > enter “Memory Diagnostics” > open the Windows memory diagnostics program. In the new window that opens, select one of the two available options. The first one immediately restarts Windows and allows the system to scan memory. If it returns an error, then you have your answer. Replace your computer’s memory and everything should work fine. However, if the scan did not reveal any errors, the problem lies elsewhere. 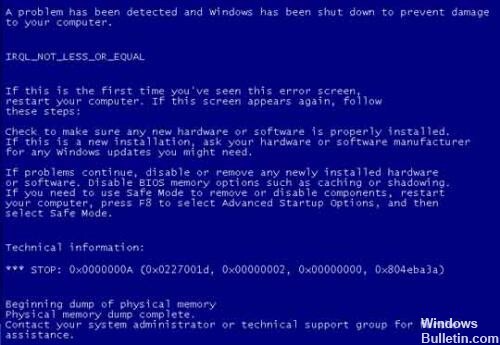 Sometimes it is also possible that the operating system of our computer gets this problem when installing or using external USB device drivers and using this IRQL_NOT….. BSOD error on the computer screen. And the simple solution you can try now is to remove all connected external USB devices from your desktop or laptop and restart your computer. After you have separated everything that is not needed from your computer, you must now use your computer as usual, just to test and check whether you still get this error or not.